For my second trip to Iceland, since I was going on my own, I decided to settle at the Reykjavik City Hostel, with one day trips. The main event was a one day PADI dry suit course in Silfra, but we'll see that soon enough. As the day was clear, we were blessed with views up to Landmannalaugar. It was such an eerie feeling to know that we were walking on land that did not exist a few years ago. The desolate lava field, with patches of snow, was really a vision from out of this world. 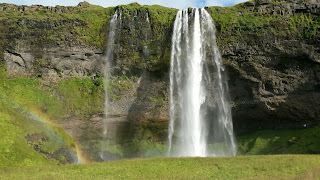 Then on our way back, we also walked around Seljalandsfoss, where you can litteraly walk around the waterfall, as the power carved a path behind it. After that, the bus took us to Thingvellir, to see the continental plaques rift, and read about the history of the first parliament. Then, while one part of the group went back to Reykjavik, we continued on to the Golden Circle, to see Geysir and Gullfoss. No need to present you with these 2 icons of Iceland, one having given its name to all geysers, and the other being one of the most powerful waterfall in Europe. And that was it for this tour, which made for quite a long day, and I needed the rest to be in shape for the next day with DIVE.is, which was bound to be hard. And it definitely was. After a first training in the pool with the dry suit instructors, which drained almost all my forces, as it is incredibly difficult to stand still with the equipment, we took the route to Thingvellir, and specifically the Silfra rift. This is the best known spot for scuba diving in Iceland, but the water is so cold that you cannot dive without a dry suit, hence the course. It is however quite annoying that it is so well known, as you can see armies of snorkellers above you. I'll have to admit, after the first actual dive, I wanted to quit. I started with a panic attack, then it was so hard to balance yourself in the water, and the final drop was that my fins didn't fit. So even though it was pristine and beautiful, I enjoyed like 30 seconds of it. But then, the instructor told us that the next dive was going to be only a fun dive, nothing to worry about to pass the course except at the very end, so I yielded (the hot chocolate did help). And I did not regret it. As previously stated, the water is pristine, and as it is filtered by the volcanic rocks, there is nothing but water there, no mineral, no nutrition, so no life. Absolutely no life. But the other face of the coin is that the vision is clear for several dozens of meters. At the end of the day, we all passed the course, and with beautiful colours in our heads. And that was it for my second time in Iceland!